2017 Hyundai Elantra Pros and Cons: Why (Not) This Car? Want a car that's fun, practical, and affordable? Then you want a sporty compact. While no one does affordable better than the Korean auto makers (at least until the Chinese get up to speed), they've yet to field a competitive sporty compact. The agile handling and communicative steering that make a car fun to drive have eluded their engineers. But the Koreans never give up. For 2017, Hyundai has taken another stab at fielding a desirable sporty compact with a new Elantra Sport. Hyundai hasn't swung for the fences. With the 201-horsepower turbocharged 1.6-liter four-cylinder engine offered in the related Kia Forte SX since 2014, the 2017 Elantra Sport can't run with a 220-horsepower Volkswagen GTI, 252-horsepower Ford Focus ST, or 268-horsepower Subaru WRX. But it also isn't nearly as expensive as those cars, and it does have a performance advantage over the 147-horsepower regular Elantra. It could hit the bang-for-the-buck sweet spot for many buyers. Nissan similarly hopes to carve out space between regular compacts and the heavy hitters with a new 188-horsepower SR Turbo version of the Sentra. So, which car comes closest to hitting the sweet spot? Highs: the red stitching and metal pedals. Low: the plainly styled hard plastic door panels. Why the 2017 Hyundai Elantra? TrueDelta's review format isn't kind to cars that are good in many ways, but great in none. Compare such cars to the best attribute by attribute, and there are no clear reasons to buy them. Perhaps the whole is greater than the sum of the parts? That'll have to wait for the conclusion. For now, what matters is that you won't find "handling" in the why-to-buy list. The Elantra Sport handles with more poise, precision, and agility than any other previous compact from a Korean car maker, including the Kia Forte SX. It also handles better than the softer, less balanced, and less communicative Nissan Sentra SR Turbo. Quicker steering helps. But it doesn't quite perform as well as or feel as good as a VW GTI or even a 184-horsepower Mazda3. Closer than any other Korean compact to date, but not quite there. You also won't find performance among the why-to-buys. The Hyundai's engine feels significantly stronger than the Nissan's, and strong enough to have some fun, but it can't deliver thrills the way the larger, more powerful engines in the VW, Ford, and Subaru can. Though less potent on the spec sheet, a Mazda3 with a non-turbocharged 2.5-liter engine is about as quick. Again, good, but not great. As is the feel of the manual shifter. A seven-speed automated dual-clutch transmission is available, but based on how this transmission behaved in other Hyundais and Kias I've reviewed--not always smooth, rarely responsive--I don't recommend it unless you refuse to operate a clutch. Keep going like this, and what do we end up with? Well, the long standard warranty that brought Hyundai back from nearly dead in North America. This warranty runs 5/60 on nearly the entire car and 10/100 (for the first owner) on the powertrain. You'll enjoy the same warranty on a Kia Forte. But others, including the Nissan, tend to have three-year basic warranties and five-year powertrain warranties. A caveat: Hyundai and Kia tend to be especially strict when determining what their warranties do not cover--read the fine print. Hyundai has been relying on low prices to sell cars for even longer than its 10/100 warranty. But as its cars have gotten better, their prices have crept out of the bargain basement. The Elantra Sport starts at $22,610 (if you want floor mats), and lists for $25,010 if you add the Premium Package (sunroof, navigation system, 315-watt Infinity audio system, automatic climate control, and blind spot warning system). As such, it's 445 to 665 dollars less than the Nissan Sentra SR Turbo. A difference, but not a large enough difference to sway a buying decision unless the cars are close in every other way. The Elantra Sport also undercuts the Mazda3 2.5 by $570 when both are similarly loaded up. But there are quite a few features offered on the Mazda that aren't offered on the Hyundai, including a automatic emergency braking, steering-linked LED headlights, a head-up display (HUD), a power driver seat, a heated steering wheel, and rain-sensing wipers. Adjust for these, and the Mazda undercuts the Hyundai by about $500. Want no options other than floor mats? Then the Hyundai does start $1,370 lower, but includes about $2,300 less stuff. Unless you personally value the additional content at less than 50 cents on the dollar, the Mazda becomes the better value. You can't directly compare the Hyundai Elantra Sport to the Kia Forte SX, because the former is only offered as a sedan while the latter is only offered as a four-door "Forte5" hatchback. Also, Kia only offers a manual transmission in its car if you also spring for the $3,600 Premium Tech Package. End result: a starting price over $4,000 higher than the Elantra Sport's. But adjust for the Kia's additional content and in value terms they're a wash--if you personally value the Kia's additional features. 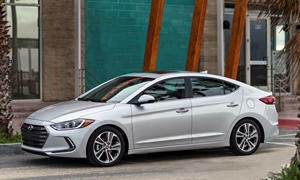 Only against the Volkswagen Jetta GLI does the Elantra Sport have a large price advantage, a nearly $4,000 difference. Even with its much higher price, you cannot get leather seating surfaces on the Jetta GLI. They're standard on the Elantra Sport. This reminds me of the first sporty Elantra I ever tested, the 2003 Elantra GT. After driving that car I concluded that "GT" must mean leather in Korean, because that car didn't handle significantly better than the regular 2003 Elantra (and thus not well). In 2003 as in 2017, leather was standard on the sporty Elantra. Shift a few degrees to the rear, and the Elantra looks far better than when viewed from the side. In general, compact sedans haven't been selling well. Before concluding that the Hyundai Elantra Sport's sticker price isn't compelling, check what dealers are actually willing to sell the car for. Dealers in my area often offer Elantras for well below MSRP. I'm less familiar with the discounts available on the Sentra. But, judging from how many of this mediocre car Nissan manages to sell, I suspect they're also large. Why Not the 2017 Hyundai Elantra? Now for the reasons not to buy a 2017 Hyundai Elantra Sport. When the Elantra was last fully redesigned, for the 2011 model year, Hyundai was pushing the limits of mass-market car design. Its new cars were swoopier and curvier than anyone else's. They stood out from the crowd, and partly for this reason Americans bought more of them. But, back home in Korea, the futuristic styling didn't play as well. Also, now that car buyers had become more aware of Hyundai's cars and of how good they had become, there seemed less need to have them stand out aesthetically. (Or so some influential executives argued.) When the time came to redesign the midsize Sonata for the 2015 model year, the Korean HQ opted for much more conservative styling. Perhaps because the new Sonata didn't sell as well in the United States, when the time came to redesign the Elantra they didn't tone down its exterior as much, but they did still tone it down. The new exterior does appear more sophisticated, but it doesn't stand out as much. Few people will be turned off by it, but it's also hard to see anyone buying the Elantra Sport because they love how it looks. Plenty of people will avoid buying the Sentra because of how it looks. I see what they were trying to do by including lines similar to those on the larger Altima, but the curves don't work with the sedan's tall and narrow proportions. It's trying too hard to appear to be more than what it is. Even if the Sentra could pull this look off it would appear stodgy. The new Elantra appears much more current, and more athletic as well. Inside the Elantra's new styling has a more negative impact. There's little in the way of artful lines. If not for the red stitching and well-bolstered leather seats added by the Sport treatment, the new car's interior would appear generic, even plain. Worse, many of the surfaces, and especially the door panels, are too obviously hard plastic. A Mazda seems much nicer inside. While the Sentra's interior isn't anything special, at least its designers attempted to include a little style. This said, the Elantra at least feels solid. In comparison, the Nissan Sentra's interior appears even cheaper and feels flimsy (especially the door pulls). And the Nissan's exterior? Burdened by tall-and-narrow proportions, it's just ugly. The Elantra Sport's B+ handling comes at the expense of a B- ride. While the Elantra Sport never seemed uncomfortable, imperfect road surfaces induce many small vertical motions. Only on smooth roads does the car feel settled. The Nissan Sentra SR, with a more absorbant suspension, manages a small win here. Upscale detailing to Hyundai's hexagonal grille. Especially elegant in black. Decent room and comfort for a sedan of this size. Hyundai has been among those manucturers offering turbocharged engines in "eco" variants of its cars. But as tuned for the Elantra Sport, the corporate 1.6T engine doesn't score well in the EPA's tests: 22 mpg city, 30 mpg highway. You'll find similar numbers on the window sticker of a Nissan sedan--if that Nissan sedan happens to be the 300-horsepower Maxima. The Sentra SR Turbo scores considerably better, especially in city driving: 26/32. I've unfairly implied the 1.6T engine is to blame. Hitch this engine to the seven-speed DCT instead of the six-speed manual, and it rates much better, about the same as a Sentra SR Turbo with its optional CVT, 26/33 vs. 27/33. Does the Elantra Sport manual's real-world fuel economy differ as much as the EPA ratings suggest? Or does it suffer from test anxiety? I suspect the latter. In my suburban driving with economy-minded acceleration and braking the trip computer reported an average of 37 mpg (with an occasional 40). The moment you sit down in each car, the Hyundai Elantra has already won. You sit oddly high in the Sentra. While many people like to sit high--hence the popularity of crossovers--it just doesn't feel right (and far from sporty) in the compact Nissan sedan. You sit much lower--but not too low--in the Elantra. The Sentra feels like a small, cheap econo-car from the driver seat, while the Elantra seems much like a conventional midsize sedan, just a bit smaller. It does not help that you sit on top of rather than in the Nissan Sentra SR's driver seat, which is so flat and firm that I found it downright uncomfortable. The Elantra Sport's front seats are both far more supportive in turns and far more comfortable all of the time. Aside from having only a minimal number of manual adjustments, they're excellent seats. You can get better seats in the Sentra by stepping up to the NISMO variant, but it's more expensive, cannot be ordered with leather, and good luck finding a dealer with one on the lot. Also, it shares most of the Sentra SR's weaknesses. The downside of the Elantra's more conventional seating height is less rear legroom than in the Sentra, but still a decent amount compared to the average compact. Though the rear seat cushion is too low to provide good thigh support, rear headroom is more limited than rear legroom. As I warned in the introduction, TrueDelta's review format isn't kind to the Hyundai Elantra Sport because it's not a car that stands high above the crowd in any particular area. But neither is it awful in any particular area. With the exception of a few C-minuses, the Elantra Sport earns a B+ in just about everything. It's a good all-around car even before we get to the Sport bits. These Sport bits--the 1.6T engine, retuned steering and suspension, sport bucket seats with red stitching--take a good all-around car and make it truly fun to drive. After decades of failing to comprehend the nuances of steering and suspension tuning, Hyundai finally has a sport compact car that's thoroughly enjoyable in typical daily driving, and that comports itself well when called upon to tackle some curves. Unlike past efforts, this one just feels right. It's one of those cases where the whole is greater than the sum of the parts. Driving the Elantra Sport back-to-back with the Nissan Sentra SR Turbo hammered home how good the Hyundai has become. The Sentra doesn't look, sit, or drive nearly as well. The only thing I'd mind about personally owning an Elantra Sport: it's a sedan, and I vastly prefer hatchbacks. If you're like me, then the redesigned-for-2018 Elantra GT will offer the same powertrain. I'm looking forward to testing it. If, on the other hand, you want a fun compact sedan, check out what your Hyundai dealer is willing to sell an Elantra Sport for. Especially with a discount one could score a direct hit on your price-performance sweet spot. 1.6T engine much more interesting with the cover removed. Performs better than the Nissan 1.6T. The trunk? Also decent. Typical of compact sedans, the rear seat folds. Hyundai provided an insured car for a week with a tank of gas. Mike Hymes of Tony Serra Nissan in Highland, MI, helpfully provided a Sentra for a comparison drive. He can be reached at 248-887-8900. 2017 Hyundai Elantra pros and cons, according to Michael Karesh: the best reasons for buying (or not buying) the 2017 Hyundai Elantra. Join TrueDelta to post your own impressions. The two things that my wife's car falls short on are steering feel and suspension tuning when directly compared with the Japanese brands (Honda and Mazda, primarily). These were the two things I was most curious about and, as you aluded to, are now up to about a "B" grade overall. Still trending upward, but still not approaching the best. Like you, I've been spoiled previously by Protege5 ownership. My current car (2007 Civic Si sedan) is remarkably similar. But this is also eye-opening, as the Elantra Sport is being directly compared to (and is pretty comparable to) a 10-year old car. I came away still preferring my Civic for the reasons mentioned above. In our market (bay area) almost all Hyundais sell for thousands under MSRP. This makes the Elantra Sport a much more compelling option as it starts to fall under $20k. If you are comparing it with, say, the 2.0L Mazda 3 sedan it starts to look pretty darn good. Personally, I love the restrained subtlety of the styling. It has tighter lines that will probably age very gracefully. I'm skeptical that the previous generation will age as well with more curved surfaces. The upcoming Elantra GT re-design also looks great.